Only for those ready to up their game. Are you frustrated when you spend so much time online – searching for important stuff – but can’t get satisfying results? The good news is that there are little-known strategies you could leverage to up your online search game. 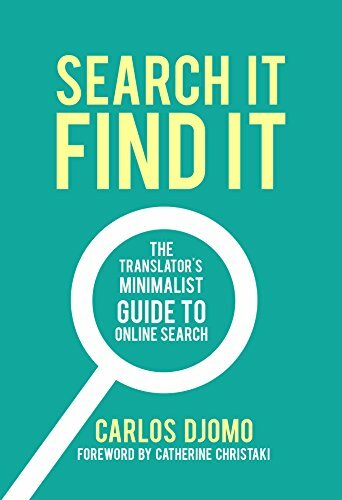 Imagine how you would feel if you could find accurate terminology, specific documentation, high-paying opportunities or virtually anything that is available online… My book Search It, Find It: The Translator’s Minimalist Guide to Online Search teaches you how to become an online search ace in no time. Stop wasting hours scouring the whole Web for accurate terminology, high-paying clients, training opportunities or anything in-between. This book reveals easy, less-known, and practical approaches ANYONE (even mere beginners or technology dummies) can apply to become online aces in less time. This book offers tips that will help you become a better translator, communicator and marketer. Get an insight into how search engines operate and use advanced techniques to leverage their full potential so you can search and find anything you want. (Re)discovery indispensable terminology tools you can’t live without: from electronic dictionaries to online term bases, glossary management add-ons and more. Where should you search for first-hand, reliable information? How to ensure anything you find is accurate to your needs? This book provide clear answers to these and more. English to French translator, winner of the 2015 Proz Community Choice Awards (#ProzCCA) for best translation article (6-Step Strategy to Translators’ Visibility), I have 8 years of work experience translating and editing technical documentation. Through @cdlancer, I transform businesses into income-generating machines and provide linguists with targeted training and capacity-building opportunities. I blog about online visibility, entrepreneurship and the business of translation. When I’m not working, I usually play football (on the pitch or through video games), draw, paint or travel to discover more about people, cultures and lifestyles. To learn more, feel free to check my Facebook business page or follow me on Twitter (@carlosdjomo).